53-year-old Peter Bosz is the new man in charge. Peter Bosz at the Europa League final last month. 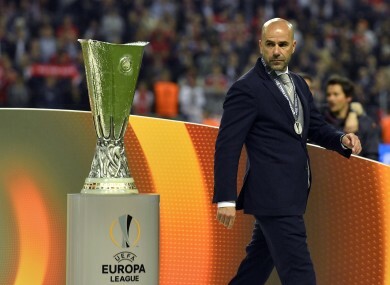 AJAX’S EUROPA LEAGUE final defeat to Manchester United has proven to be the last match of Peter Bosz’s reign with the Dutch club after he has been appointed to take over at Borussia Dortumnd. Bosz replaces Thomas Tuchel, who was sacked last week just three days after he had led the club to German Cup glory. Tuchel had guided Dortmund to their first major trophy in five years when they won the domestic cup with a 2-1 final success against Eintracht Frankfurt. Bosz has signed a two-year contract with Borussia Dortmund and departs after only spending a single season with Ajax. He joined last summer from Maccabi Tel Aviv and guided Ajax to a second place finish in the Eredevisie. It was in Europe where his greatest success was enjoyed as he steered Ajax to the Europa League final where they lost 2-0 to Manchester United in Stockholm, as Paul Pogba and Henrikh Mkhitaryan both found the net. Bosz takes over at the German club after a campaign where they finished third in the Bundesliga to book a place in next season’s Champions League. In an official club statement last week, Dortmund denied Tuchel’s departure was over a disagreement with the board. “We thank Thomas Tuchel and his training staff for their successful work at BVB,” the club said, adding that the “cause of the separation is by no means a disagreement between two people”. Email “Borussia Dortmund turn to Ajax for new manager after sacking Tuchel”. Feedback on “Borussia Dortmund turn to Ajax for new manager after sacking Tuchel”.